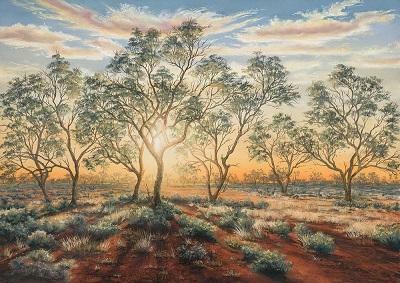 Enter your email address below to enter the giveaway draw to win this Jenny Greentree unframed reproduction ‘The Outback Shines’. Special size 568mm x 405mm valued at $270. Draw will take place 11.00am, Monday 29th April, 2019. Winner will be contacted by email and prize will arrive via Australia Post. The filling of Lake Eyre, one of Australia’s rarest and most wonderous events has been captured by Jen in a series of works that culminated in a solo exhibition in Brisbane in November 2012. Jen was introduced to this amazing experience by Graham and Deb of Travel West tours. From the platform of the 35 seat plane with Graham’s expert commentary, Jen had one of the most amazing days of her life soaking up the sights beneath her and capturing a store of reference photographs. This experience, coupled with a subsequent comprehensive ground tour which made sense of the aerial images, equipped Jen to portray this section of Australia’s outback in a way seldom seen. The opening night on the first Friday of the exhibition was a great evening. A perfect crowd of over 50 people with the atmosphere being set by their joy and amazement of the art. Graham Reid of Travel West tours performed a terrific opening. Dinner at The Vine restaurant was enjoyed by many to top off a wonderful night. The exhibition ran for 2 weeks and was well attended and sales defied the prevailing market. There are still some originals left. To avoid disappointment, don’t leave it too long if you are considering purchasing. You can either come into our gallery at North Bourke or contact us via email or phone and we can ship to you. The full exhibition can be viewed below.